Scientists have had a hunch for some time that cilantro hating might be partly inherited. 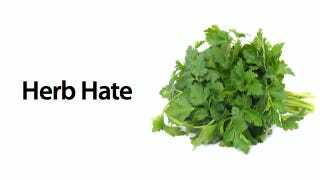 But now a genetic survey of nearly 30,000 people has given us a definitive answer: hating cilantro is hard-wired into your genes. A large chunk of the US population—including the likes of culinary goddess Julia Child—have claimed that it tastes offensive. Kinda like soap, in fact. It spreads further than these shores, too: a recent survey suggested that 21 percent of east Asians, 17 percent of Europeans, and 14 percent of people of African descent all claim to be repulsed by the stuff. Now, consumer genetics firm 23andMe, based in Mountain View, has carried outa genetic survey of 30,000 people to get to the bottom of the problem. By identifying those who didn't like cilantro, researchers, led by Nicholas Eriksson, were able to pinpoint genetic variants linked to cilantro hating. The strongest variant lies within a cluster of olfactory-receptor genes—part of the genome which influences our sense of smell. Buried within that cluster is a gene called OR6A2, which encodes a receptor that makes people sensitive to the aldehyde chemicals contributing to cilantro's characteristic flavor. The findings were confirmed in a second follow-up study which produced the same results, and have now been published on the arXiv server.